This game by Betsoft is situated in the times when Greece ruled the world. That is why the playing field is set in the middle of a beautiful Greek garden with a temple in the background. 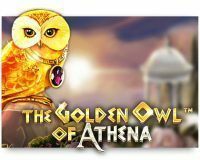 The Golden Owl of Athena plays a central role, not only does it pay out very nicely with 5-of-a-kind, but it also fulfils several essential functions within the game. The graphics and animation are of decent quality and the sound effects, while a bit too present at times, positively contribute to the excitement. Read on and find out all that Golden Owl of Athena has to offer you and just how you can abscond with the treasures of the Greek Empire. 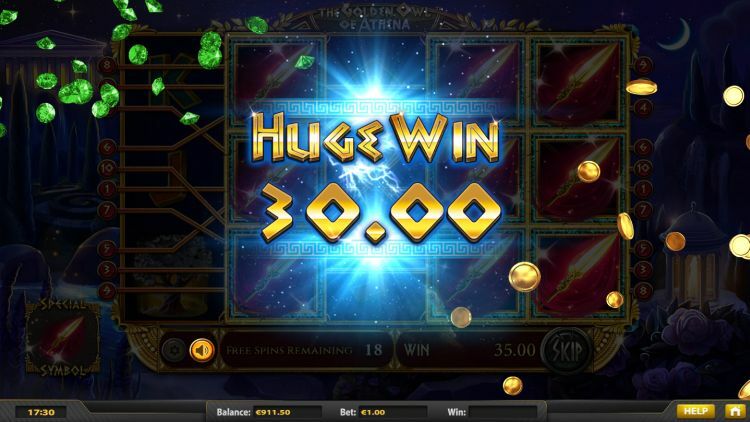 How does the Golden Owl of Athena slot work? As we mentioned, the playing field is set in the middle of a beautiful Greek garden. The game is played on the standard five reels and three rows with symbols that are related to the Greek Empire theme. You have 10 fixed paylines at your disposal on which you have to attempt to make the winning combinations. There are fixed amounts per spin which can range from $€ 0.01 to $€ 1. So, the minimum bet will cost you $€ 0.10, and the maximum will be $€ 10, per spin. The theoretical payout rate of 95.05% is lower than the average for an online video slot, and that is a negative for us. The variance we estimate to be medium. The symbols of the game are divided into high, medium and standard value. Of the high-value ones, the dark-haired prince is the one that will pay out the most with 500 x your total bet with 5-of-a-kind. This number may change the mind of the high roller that at first glance was thinking this slot, with a maximum bet of $€ 10, might be of no interest to him. The truth of the matter is that in 1 spin you could grab $€ 50,000! And in the bonus round, it is entirely possible to spin a full screen of the same symbols. The symbol with the Greek temple and the one with the tree are the other two high-value symbols. These are good for 200 x your total bet on a 5-of-a-kind. The medium value symbols consist of a helmet, a dagger and a golden vessel. 5 identical ones of these will earn you 75 x the total bet. And then there are of course the standard win symbols consisting of the well-known card symbols J, Q, K, and A. 5-of-a-kind of these will net you a maximum of 15 x your total bet. The key to this game is Golden Owl of Athena. This symbol not only serves as the Wild and replaces all other symbols; it has another important function on which we will expand a bit further down. By the way, if you manage to spin 5 identical ones of these symbols, you will see a return of 200 x your total bet. Betsoft also included the Double Up feature in this game. Choose half your fortune or all of it, then choose heads or tails and flip a coin. Make the correct choice, and you will double your money. 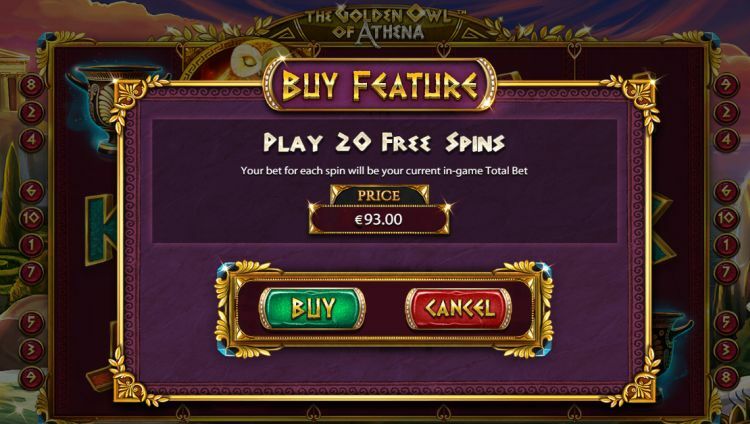 Perhaps the most crucial function that Golden Owl of Athena has is the activation of the Wisdom of Free Spins Bonus game. Should you not want to wait until you spun 3 golden owls, then there is a nice option available to you, courtesy of Betsoft. You can buy 20 free spins for 93 x your total bet. The rest of the bonus round works exactly as it does in games like Book of Ra. That is because Golden Owl of Athena is a true clone of Book of Ra. There are of course dozens Book of Ra clones made to date, but Golden Owl of Athena turned out to be a really good slot that can pay you enormous amounts of money. We think the fact that you can buy free spins is an excellent option for those of us with little patience and fat wallets. It does take away some of the excitement, but that is not the end of the world since everything that is truly interesting in this slot happens during the free spin bonus. 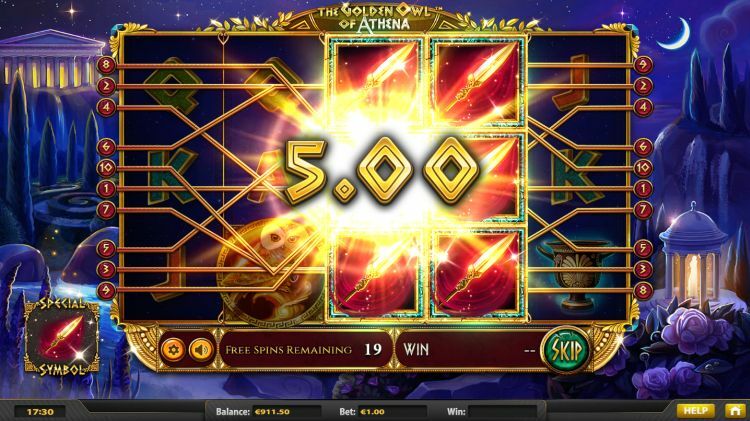 Where can you find the Golden Owl of Athena slot? 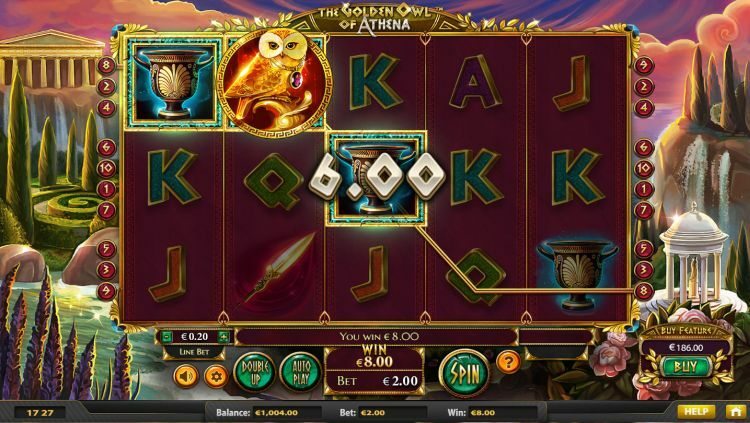 The Golden Owl of Athena slot is found at all reliable Betsoft casinos. One of these Betsoft casinos is Slots Million, which is one of our favourite online casinos.